In truth I didn’t intend to release another update so soon. But I decided that I would release a City Link replacement inclusion for those of you who would rather not have them in the mod. As a result I have released a version that includes 4 new UK skins and the replacement mod. It is worth noting that this will likely be the final UK skin update for this mod, it now contains 31 skins so I really don’t see the need for more. I may make an exception if I spot a really nice livery on the road. As far as the City Link replacement mod goes, it is included in the main rar download on the AI Vans page. 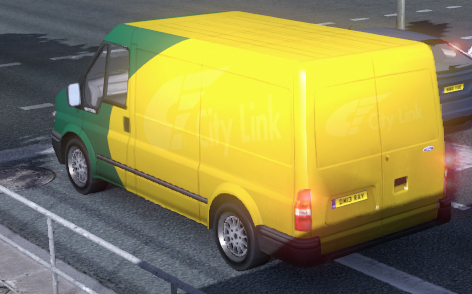 If you wish to replace the City Link skin just activate the mod. If you’d prefer to keep City Link, then you don’t need the extra file. I have left open the replacement mod, so if you want to use it to replace City Link with your own company you can do that too. I’ve included the transit template for those of you who would want to make your own skin.